President Obama: “Iai??i? ?d ask the American people to think about how they can get our government to change these laws, and to save lives, and to let young people grow up.” Call your members of Congress right now. It happened again. Another school shooting. Americans are sending thoughts and prayers to the people of Roseburg, Oregon. Our thoughts and prayers are not enough. It does not capture the heartache and grief and anger that we should feel. And it does nothing to prevent this carnage from being inflicted someplace else in America. We’ve become numb to this. And, of course, whatai??i? ?s also routine is that somebody, somewhere will comment and say, Obama politicized this issue. Well, this is something we should politicize. It is relevant to our common life together, to the body politic. Iai??i? ?d ask the American people to think about how they can get our government to change these laws, and to save lives, and to let young people grow up. Please call Congress right now. Tell them America wants common-sense gun safety laws like background checks and an assault weapons ban. Republicans in Congress need to hear about this — because they too often hear from a small but vocal minority who oppose all gun laws. Democrats in Congress need to hear about this — because even many supporters of gun laws have become dispirited, and they won’t act boldly in the absence of public outcry. Take part in ending these tragedies — call Congress today. 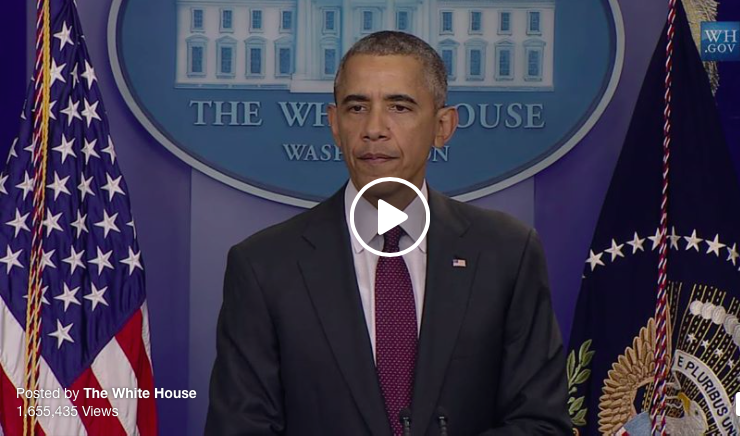 Watch the President’s remarks. Call Congress now. Then, pass this on.